Potatoes get a bad rap because they are a high glycimic starchy carbohydrate making them a more calorie dense vegetable. But they are outrageously helpful when transitioning to eating more and more vegetables. I find that my kids will eat more vegetables and even re-try rejected ones if they are mixed with a little white potatoes. This recipe mixes good ol’ Idaho spuds with a more nutritiously dense sweet potato (orange colored) and beets (pink colored) because kids can be highly resistant to sweet potatoes and beets on their own. Start at whatever ratio you think will work best with your kids (or yourself) and you’re likely to work your way up to the real deal someday. No pressure though. 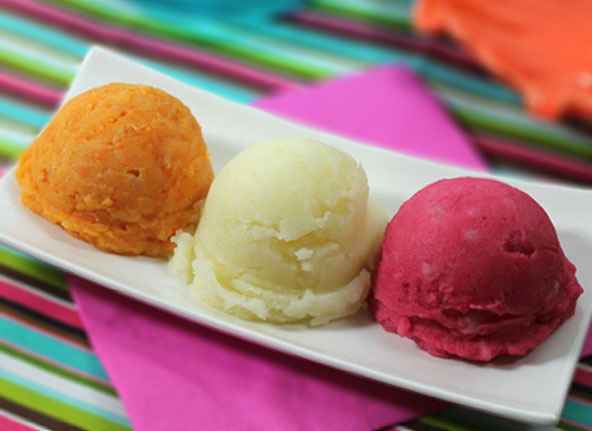 Cauliflower is also excellent to add in making these colorful more nutritious mashed potatoes. Cauliflower makes the potatoes a lighter color, add a mild and delicious flavor, have less calories, as well as lower potatoes glycimic load. And don’t forget the amazing cancer fighting properties found in cauliflower. Cauliflower is definitely a win win. 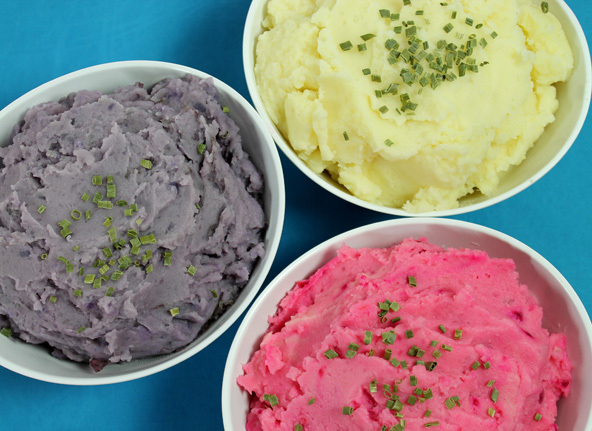 The purple mashed potatoes are made with natural purple potatoes, the pink mashed potatoes are made with white potatoes and a small amount of beets and the white is with white potatoes and cauliflower. Cauliflower would be great added to all of them. These orange mashed potatoes are made with white potatoes mixed with sweet potatoes. Consider this as a tricky way to ease into liking sweet potatoes. Use the Diary-Free Mashed Potato recipe. Pink: use 5 medium white potatoes and 1/2 small beet. Blend or puree the steamed beet separately in a small blender before adding to the rest of the steamed potatoes. Orange: use 5 medium white potatoes and 1 small yam or sweet potato. 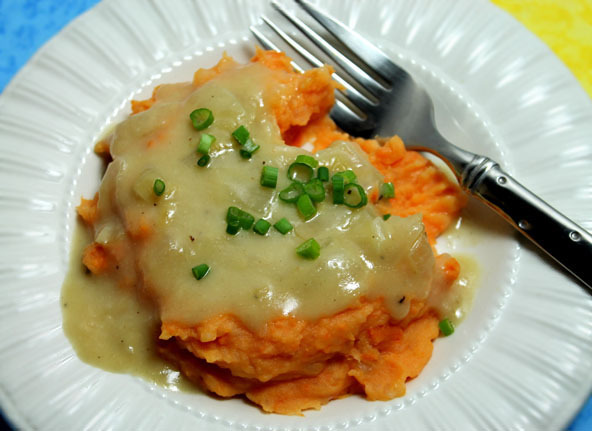 Blend or puree the steamed sweet potato separately in a small blender before adding to the rest of the steamed potatoes.